The Bonaire Tower Fan can be operated by remote control for ease of use and includes remote control storage. Sleek silver wings flank the sides of the tower for a modern look. 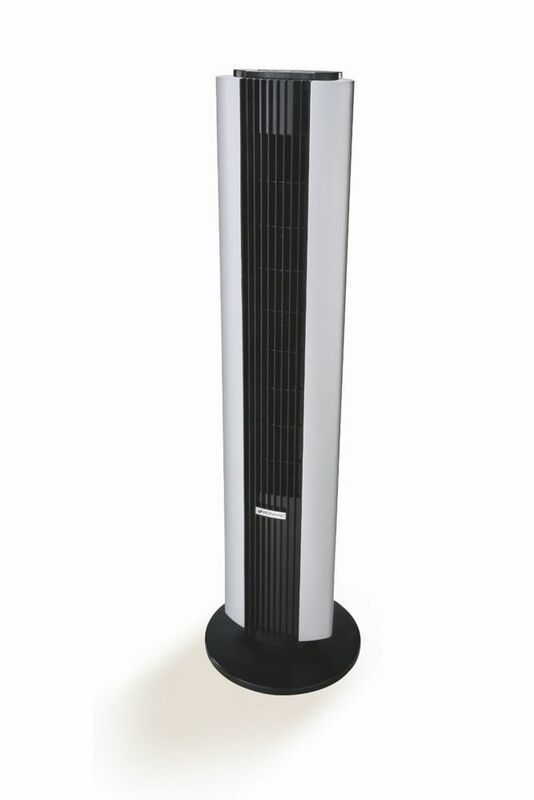 Lasko's T42552C tower Fan with remote control, features many features for every use. High reaching tower design for maximum air delivery and flow, auto-off timer from 1 to 7 hours, elegent profile and simple No Tools base asembly. It also features top mounted electronic touch controls, wide spread oscillation, three quiet speeds. It has an easy carry handle and on board remote storage slot. Featuring Lasko's patented safety fuse technology 'the Blue Plug"
42 Inch Tower Fan with Remote Control The Bonaire Tower Fan can be operated by remote control for ease of use and includes remote control storage. Sleek silver wings flank the sides of the tower for a modern look. 42 Inch Tower Fan with Remote Control is rated 4.0 out of 5 by 2. Rated 4 out of 5 by Ket50 from This fan is just amazing. Quiet and even cooling. The fan is amazing. I just love it. I am not thrilled about the remote. The remote seems a bit unpredictable. Rated 4 out of 5 by Texas from Like the remote. Keeps me kool. Size is great. Blends into room decor.